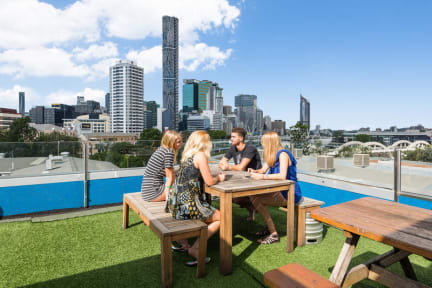 Summer House Backpackers Brisbane i Brisbane, Australien : Boka nu! Loved the free BBQ and pancakes good value for money. A bit to warm in the room though made my sleep less good combined with people slamming the door. 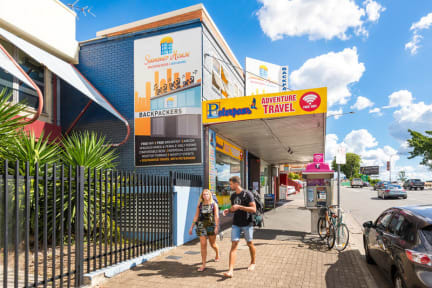 Great location, 10min walk from the Brisbane transit center (bus terminal). Friendly staff. Small hostel but they had a theme for each day, like “Italian night” or “pancake day”. I just stayed at summer house for one night but I loved it. Loved the sockets right beside your bed. It was clean and the staff was really helpful. Took the shuttlebus early in the morning to the airport wich was really easy and the staff helped me with that too. The only downside was the very small kitchen. A very party atmosphere! Location was good close to the bus terminal. We just slept there one night so didn't really have time to judge the facilities but we had a nice evening with the friendly people living here. They gave us goon. I’m happy with this hostel! It’s not very personal, I guess because it’s a big city-hostel. I lived in a 4 bed girl-dorm which I can really recommend, my friend lived in this like 20 people dorm and that was horrible. It’s very clean (at least my room) and only 20 minutes to the Queen St and South Bank. Awesome rooftop. I’d recommend it! Overall a nice hostel with nice staff and rooftop. The room didn’t have any window though and cockroaches in kitchen on the other hand..
Bra rum, bodde i 12 bäddarsrum. Litet kök, blev fort trångt, få kylar att ha sina matvaror i, flyttades fort runt.. Svartmögel i duschen, annars relativt fräscht. Hade en storstädning medan vi bodde där, stor skillnad efteråt. Häftig rooftop att hänga på, fin utsikt över floden och skylinen. The Wifi worked pretty good and I liked the free pancake breakfast on sundays. Just stayed for two nights but would consider stay there again! An okay hostel. Just a lot of Germans!